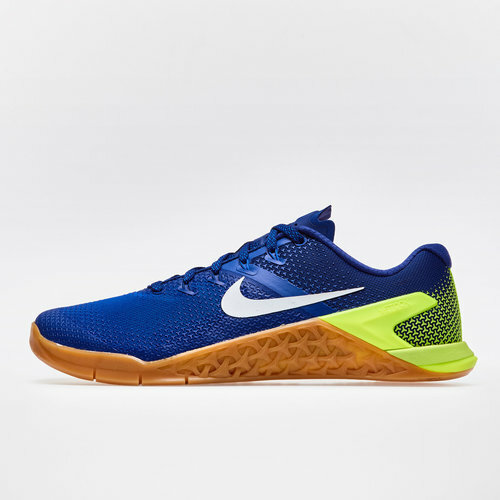 Be ready for those high-intensity workouts with the Nike Metcon 4 Training Shoes in Volt, White, Racer Blue and Gum Medium Brown. From sprinting to lifting, these Nike Metcon 4 can do it all thanks to an updated drop-in midsole that's both softer and more flexible in the forefoot, meaning you're ready to sprint off. For when your training takes you into weights, a flat platform and firm-rubber heel give plenty of stability for explosive movements. Elsewhere in the trainer, Flywire cables offer a lockdown feel and sticky rubber in the forefoot provide plenty of traction. These Nike training shoes also feature a reinforcement in high-wear areas and are the most durable training shoes Nike have offered to date, perfect for high-intensity training sessions whilst being light enough to keep you fast and mobile on your feet. In a design that demands attention, train to a higher level in these Nike MetCon 4 Training Shoes.